Studying an artist’s work, reading an art critic’s opinion, and looking at recent as well as older artwork to understand how perspectives and point of views do change is important. All your findings and evaluations are based on the many exhibitions of artwork which take place around the world since many decades. An exhibition venue’s type, concept and vision contributes in an important if not fundamental way to the artist’s positioning – on the long way to perhaps showing after many years in a major museum or selling in a gallery or at an auction for a high price. It means that analyzing the exhibition records of artists, curators, and exhibition venues can be an important source of information helping to reveal a picture about the individual qualities of an artist. The Exhibition Records Summary for each artist, curator and gallery, museum, non-profit and collector’s venue on their artist-info page show the many valuable aspects the analysis of hundreds of thousands of exhibition records is providing. The Summaries complement artist-info’s Artist Exhibition Statistics showing the 100 artists with the highest number of exhibitions and the powerful VisualizingArtNetworks.com service, which analysis with a network graph and clusters and sub-clusters how artists, curators and exhibition venues are connected. An artist’s biographical notes might be a good starting point. Unfortunately in most cases they don’t provide information on the exhibition history of exhibition places, nor participating artists in group exhibitions, nor curators. artist-info’s cross-linked exhibition histories for artists, curators, galleries, museums, non-profit, and collector’s venues provide this substantial information with exhibition records from 1930 onwards for more than 140.000 artists, more than 10.000 exhibition places worldwide, and more than 440.000 exhibition records. How to read the individual Exhibition Records Summaries for all Artists, Curators, and Exhibition Places in artist-info. The summary section’s left part analysis the artist-info exhibition history records by numbers, type, countries, and cities. Besides the total number of Exhibitions in artist-info the number of Solo- and Group-Exhibitions is displayed in brackets. Whereas Solo-Exhibitions allow an in-depth presentation of artwork, the theme of a Group-Exhibition brings together different artists with the advantage of showing their individual approach and strength. At which type of Exhibition Venue took place the Solo- and Group-Exhibitions? The numbers show the relation between gallery, museum, non-profit, and collector's venue exhibitions. The numbers are visualized by a color bar, showing the relation between Gallery, Museum, Non-Profit, and Collector venue exhibitions. Took the artist part at exhibitions of many different galleries or museums, or just at one place? The numbers and the graph are showing the result of analyzing all exhibitions in artist-info and their venue typ. As an example artist-info records know for Pablo Picasso exhibitions in 22 countries. The cities with the highest number of Exhibitions based on artist-info records know. artist-info is researching exhibition information from 1930 until today. The time scope for each artist, curator, gallery, museum, non-profit or collector's venue might be different, depending on the available sources. Please feel free to contact by email us for adding additional records. The summary section’s right part displays the top 5 artists, exhibition places and curators found in artist-info exhibition history records. Visualizing Art Networks The artists, curators, and exhibition venues in artist-info may be connected with Artwork Offers, Exhibition Announcements, or Artist Portfolios. The icons show if they are available. Due to many group exhibitions the number of artists who are related through these group exhibitions with the summary's artist can be high. Some artists are repeatedly present in this Group Exhibition. The top 5 of them are displayed in this list, together with in brackets the number of times and following after the hyphen the total number of exhibitions of this specific artist in artist-info. Which are the venues where the summary's artist was shown most? The list shows the top 5.
Who are the curators of the summary artist's exhibitions? The list shows the top 5. 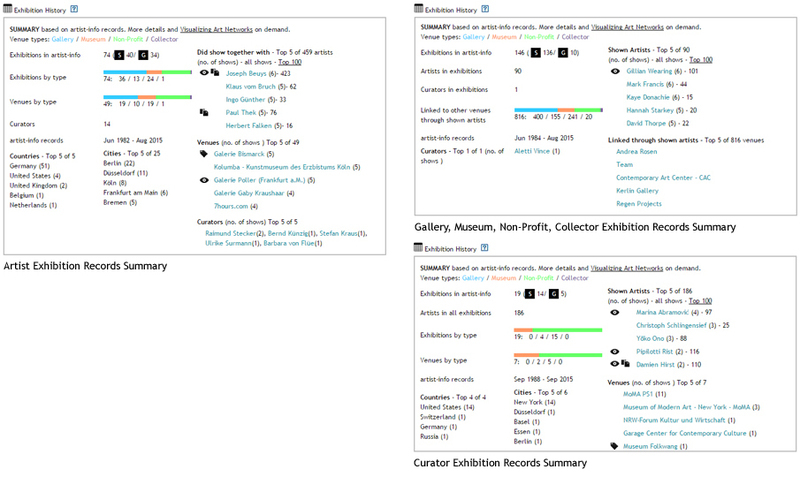 Depending on the number of a curator's exhibitions in artist-info records the number of shown artists can by high. Some artists are shown repeatedly and are displayed in this top 5 list. The list displays the top 5 Galleries, Museums, Non-Profit or Collector's venues where the curator did curate exhibitions, based on artist-info records. Depending on artist-info records the number of shown artists can be high, like e.g. for the MoMA, New York with 2342 artists in 833 exhibitions in artist-info. Some artists are shown more than one time. The top 5 list shows these artists together with in brackets the number of exhibitions they took part as well as after the hyphen the total number of exhibitions in artist-info records. The list displays the 5 curators with the highest number of exhibitions, based on artist-info records. The artists in the exhibition venue's exhibitions did show at other venues as well. This query finds all venues in the cross-linked exhibition history records in artist-info and displays the top 5 of them.